ARK Design G700 Clutch Kit - Dezod Motorsports Inc - Home of the automotive performance enthusiast since 2002. 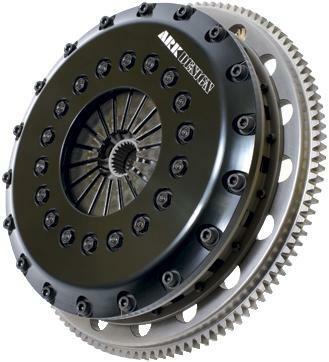 The G700 clutch from Ark Design is a multi-plate unit engineered to handle high power transfer to the drivetrain while maintaining everyday drivability. To prevent slippage that can occur with increased power and torque, multiple clutch plates are utilized to increase friction area for greater power transfer. Each disc has the clutch material chemically bonded so there is no need for rivets to secure the friction materials to each disc face. By chemically bonding the clutch material the friction surface area is maximized and disc longevity is enhanced greatly. Also to make sure the entire clutch assembly is able to handle high levels of power and torque the pressure plate is a free floating design devoid of any straps or tabs that may fail under high stress. Included with every G700 clutch is a specially developed release bearing which reduces clutch pedal pressure for ease of engagement. This product is designed for use on off-road/competition vehicles only. The use of this product on a pollution controlled vehicle or on a public highway may be illegal in your country. Please check your local laws. Images may not be representative of the actual product.